1. Why are work measurement and time study activities still necessary today? 2. How do the latest approaches for determining time standards, as shown in the UMMI example, fit with the concepts of worker empowerment and team work? 3. What are the major differences between work measurement and work sampling? What are the objectives in each case? 4. 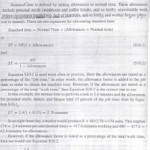 Is there aJ}inconsistency when a company requires precise time standards and, at the same time, encourages job enrichment? 5. The conclusion of this chapter describes Southwest Airlines's fast flight turnarounds. What do you think has to be done inside the terminal to attain this performance? 6. Automated systems such as voice recognition units (VCUs) increase the efficiency of a call center, but what are the disadvantages of these systems?